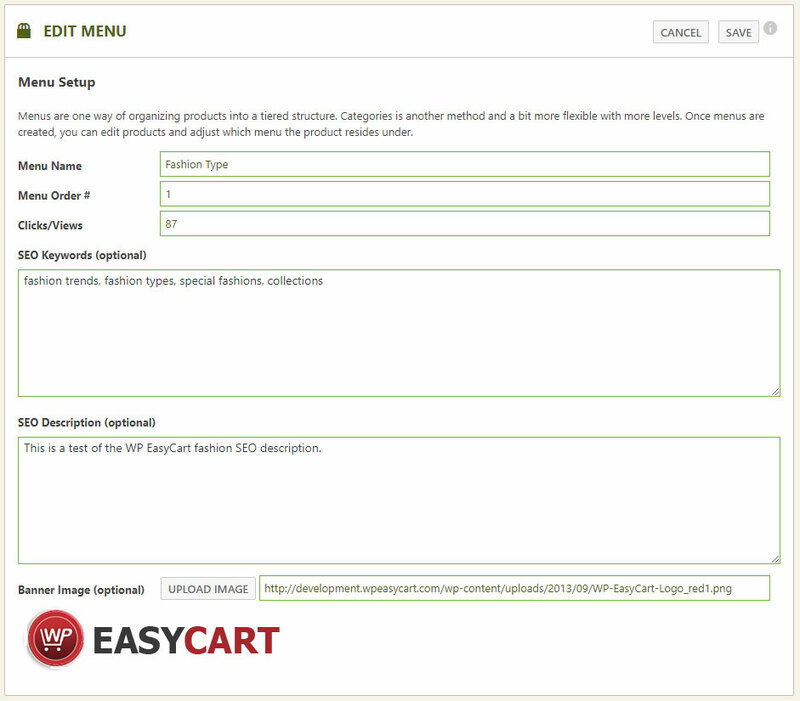 Menus in EasyCart offer a tiered system with menu -> sub menu -> sub sub menu capabilities. Many customers ask if they should use menus or categories to group products together, and we always recommend categories instead of the menu system due to flexibility, but depending on your needs, menus may be just what you need. Categories will actually do the same sub menu system that menus will do, they are just organized differently on your main menu. Enter a menu name and sort order number. Clicks & views are recorded for statistics only and something you may wish to look at as your store operates for an extended period of time. SEO keywords and description let you add important aspects for search engine optimization to this store page. The banner image is optional, but if you would like to display a custom banner dynamically on this product menu page, you can upload that here. Note: Learn how to add these menus to your WordPress system by Clicking Here. Learn how to add shortcode for these menus by Clicking Here. Once you create a main menu, you can add sub menus by selecting the sub menu button. Notice in this example, we are editing the sub menu item for ‘Fashion Types’. At this point we can add new sub menus or we can even edit the sub sub menus under each of these to create a tiered hierarchy menu system. You can accomplish good product organization this way, but EasyCart only goes 3 menus deep, while categories can often produce the same effect you get here, but with added flexibility over menu systems.